Over the last few months I have been taking photographs of taxi fare tables to be found in many of Bangkok’s Taxi Meter taxis. Up until now I have done nothing with them. Yesterday and today, however, I made a decision to prepare the spreadsheet that would anyone to enter the distance travelled and calculate their fare. 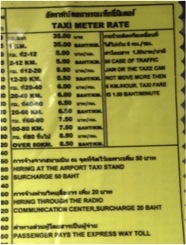 I also wanted to be able to build in the 50 Baht surcharge for taking the taxi from one of the two major airports in Bangkok and for taking a taxi having ordered it over the phone from the central communications centre. I also wanted to build in the possible fare addition if the car is stuck in traffic. I did all of that and I have to say it took me a lot longer than I expected. 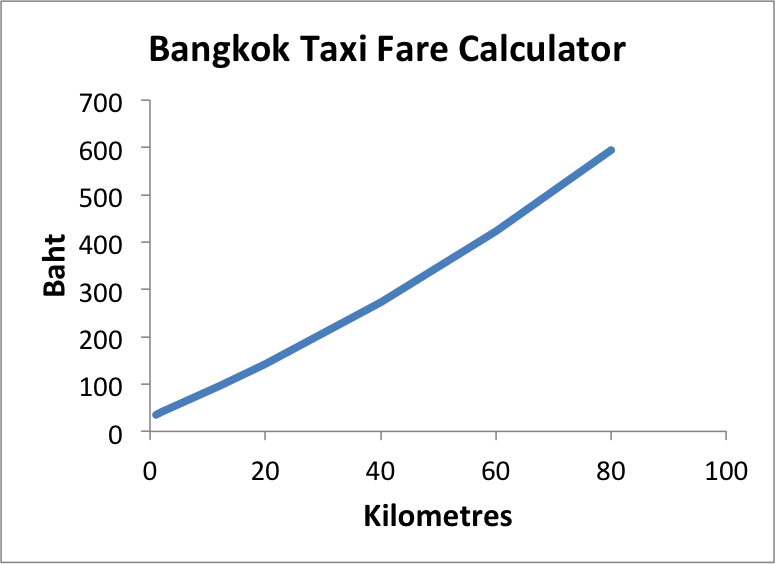 Of course, this graph doesn’t cover anywhere beyond Bangkok but the schedules I have seen in the taxis will quote for taxis to Pattaya, Phuket, Surin and other long distance destinations. I couldn’t believe it took so much effort to do this but take so long it did! There is a table on which this formula is based that I have called the Calculation Engine but I am not showing that here! That’s it: a simple but surprisingly difficult model to program.